Today I'm sharing a pork recipe that is impressive enough to serve to guests but easy enough to prepare on a weeknight. You will just need to think ahead enough to prepare a marinade ahead of time. 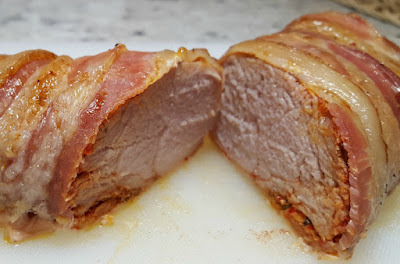 This bacon wrapped chili lime pork tenderloin gets its flavor two ways. First is the flavorful chili lime marinade that you'll want to use to marinate your pork tenderloin for at least eight hours. 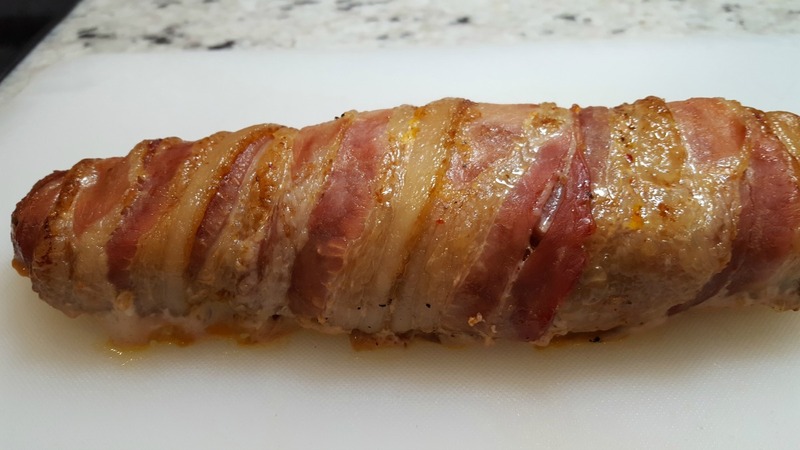 Then, just before cooking, you'll wrap the tenderloin with bacon. It's good stuff! Pork is a meal choice that works any time of year. It works for comfort food recipes and lighter grilling options. 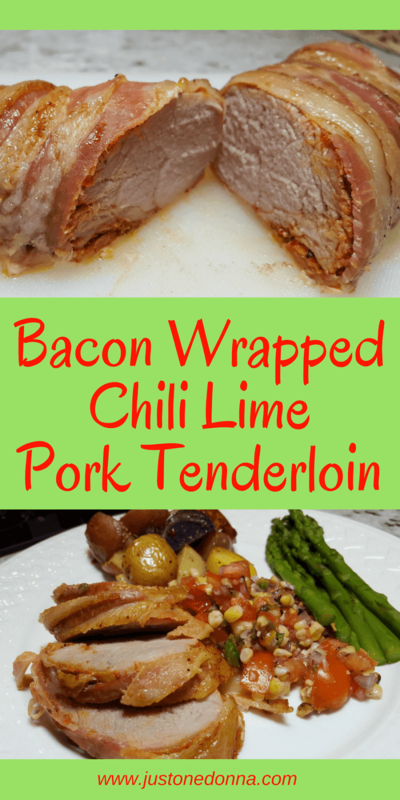 This bacon wrapped chili lime pork tenderloin is a dinner choice that falls between the light meal and comfort food dinner options. I love using pork tenderloin because it is quick to prepare and also cooks quickly. It just so happens that I chose a chili lime marinade for this pork tenderloin, but just about any marinade will work. You might even want to try this with one of the pre-seasoned pork tenderloins you can buy at your grocery store. Then you won't even have to plan ahead. How easy is that! The lime in this chili lime marinade delivers a fresh pop of flavor. Be sure to add the zest of the lime for an additional zing. As you can see in the picture, I added my tomato and grilled corn relish along side my pork tenderloin. Oh, it was so delicious! I highly recommend the relish on the side. In a small bowl. mix together all of the ingredients, except the pork tenderloin and the bacon. Place the pork tenderloin in a glass or ceramic baking dish or a zip top plastic bag. Pour the marinade over the pork tenderloin being sure to cover well. Refrigerate overnight, or up to 48 hours. The longer you marinate, the more flavorful it will be. Preheat your oven to 375 degrees F. Wrap the marinated pork tenderloin with the slices of bacon. Place the prepared pork tenderloin on a shallow baking sheet. Toss chunks of potato with olive oil, salt, pepper and garlic powder to roast along side the pork tenderloin. Bake the pork tenderloin for 40-45 minutes, or until it registers 145 degrees F on your meat thermometer. 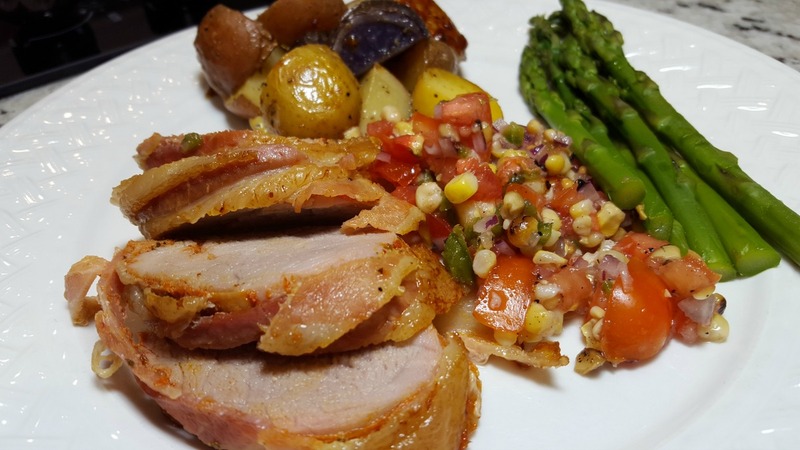 Don't forget to check out my tomato and grilled corn relish to serve as a side with this pork tenderloin. It's especially nice this time of year.